Can AUD/USD buyers keep the momentum for an upside extension? But the aussie is trading slightly softer today on the announcement that the federal election will take place on 18 May, presenting some political risks for the currency in the month ahead. That said, technically buyers are still in a comfortable position based on the daily chart. Price is still holding above the 100-day MA (purple line) and the topside wedge resistance, which it broke above in overnight trading. That presents a more bullish breakout but we'll have to see if buyers can show the conviction to hold a move higher here. 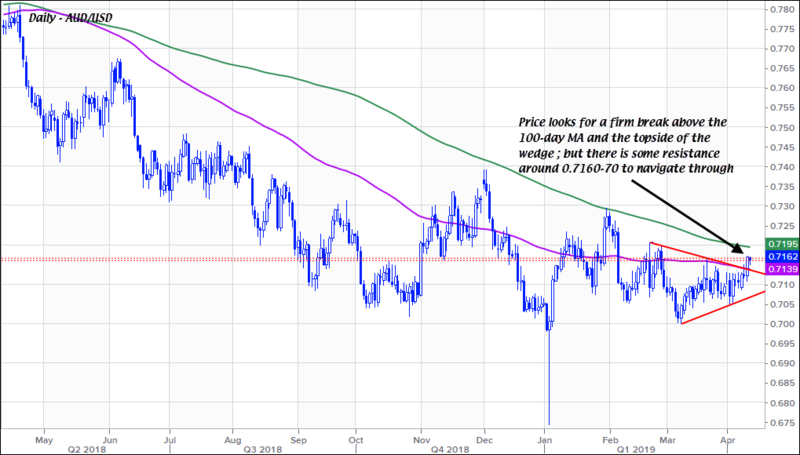 There is some minor resistance around 0.7160-70 for the time being but if price is able to climb above the 200-day MA (green line) of 0.7195, I reckon there won't be much to stop it from rising back towards the 0.7300 and possibly 0.7400 handle - given how traders are positioned short on the currency since last year. However, in the bigger picture, AUD/USD remains a yields story and as long as the RBA looks more likely to cut rates than the Fed, there will still be reasons for sellers to come back in and drive price lower based on the yields spread divergence.